Markets have changed. The way they move has changed. The software has changed, allowing you to now place orders to buy and sell directly from your smartphone. The crowd has changed. It used to be completely human, but now it is estimated that over 70% of the daily volume in the market is generated by computer programs. The good old days of simply buying and holding are gone...it's not enough anymore. You used to be able to just buy good stocks and trust that your future was secure. But not today. I'm not happy about it, and I wish that old approach could compete. That's how I started and grew my account many years ago. But it's a fact of life that the market changes and some adjustments must occasionally be made in order to succeed. There's nothing wrong with a long-term time horizon, but it needs an enhancement in today's market. But you know what hasn't changed? The way that Traditional Wall Street tells you to invest. The SAME stuff that people were told to do 30 years ago is STILL being taught today. And it's a crime. Because while all that stuff did work for a very, very long time...today...not so much. Not in a world of flash algorithms, mobile apps, dirt-cheap commissions, and a global economy. I'm frequently asked "how do you manage your IRA account?" And I tell people that the way I manage my long-term positions is actually pretty simple, but that it would take a couple of hours to explain it to them. The next question they ask is always "Well, can I pay you to teach it to me?" And the answer was always no, but maybe one day. Well, "one day" has arrived. For you, that means it's your opportunity to get your hands on the same return-boosting system I've used for years...which I learned through trial and error...lots of them. It allows me to essentially "rent out" my stock positions for income. It's all battle-tested and profit-proven. And it's the same system I'm using right now...today...on my IRA accounts (not some old, outdated method that doesn't work anymore). For the first time ever, I'm going to show you everything. From what I know to exactly what I do to drastically improve the returns in my IRA accounts (and others). You'll learn what's flawed about the traditional approach and what you can do TODAY to ramp up your profits. I'll show you what works in TODAY'S world...where mutual fund and diversification propaganda are pandemic. And that's what I've created. I call it the Turbocharge Your IRA system. Think of it as a secret weapon with the potential to double, triple, or quadruple the return you'd get from just the stock alone. All with no additional risk to your original investment. It's one tiny addition you can make to your investing that will get you way, way, way better results. Oh yeah...and it takes about 5 minutes per week to do. And with that extra time, you can get back to your life. Knowing that your future is brighter than it would be just following the buy-and-hope approach. No more researching binges on a quest to find the growth prospects of a company. No need to day trade or examine a thousand charts a day or camp out in front of the PC. Just a few minutes per week and you're all set. You Don't Need To Take On Any Additional Risk To Benefit From Options Either. You Just Need To Know How To Incorporate Them The Right Way. And that's what this system teaches you. You're going to learn how to take just a few core concepts and have them produce far better returns than you've ever realized were possible. You'll learn to use the concept of cost basis reduction. This is probably one of the most important things you need to learn for long-term investing. It can easily improve your returns on existing stock positions. It can also easily help you become profitable in a new stock position right after you incorporate this technique. And it will take you exactly 2 hours and 56 minutes to learn how to do it in this course. The "old school" way of investing assumes a perpetually rising market. And that absolutely kills your returns. The chances of a stock moving higher within the first month of purchase are close to 50-50. So it's a coin toss whether or not that position starts to produce a profit for you. The Turbocharge Your IRA system fixes this for you to improve your chance of profit. This is the easiest, fastest way to grow your account, without taking ANY additional risk. I know this because I've been doing this for for well over a decade. I know it works because I use it. These are real-world techniques based on my daily experience for many years, not some "breakthrough" based on someone's random one-hit-wonder. All in plain English. Over 2 hours worth of instruction where I walk you through exactly what you need to know about what works. Simple. The new rules you need to follow. Do this and don't do that. Very straight-forward, very to the point. This is going to be on-demand training. That means it's available to you via video based lessons, anytime you want it. From experience, I have found that people need to learn the system and be able to review the lessons, so you get lifetime access. First up will be the video training modules. These video training lessons cover all the material you need to know for this system, however, they are broken up into smaller, individual lessons. The benefit for you is that you can break up your time and watch some of the lessons here and there without enduring a multi-hour presentation or having to travel cross-country to see it. You can watch what you want and easily find the lessons again if you re-watch them later. All with 24/7 convenience. Second, you get access to me. I've been doing this a very long time, and I'm here to help you. So as you have questions you need answered or if there's something you need to clarify, I'm right here. Your investment choices are yours, but I'm always glad to give a second opinion or offer some insight whenever you're facing a decision. The bottom line for you? You are getting 2 products in 1. You are getting access to the training course outlining everything I've learned through real-world experience (including countless costly mistakes over the course of more than a decade), all in a structured, concise course. And you are getting direct access to me for help whenever you need it. A proven strategy that generates consistent returns. An add-on to your current investment approach with no need to overhaul it. Ways to hedge individual stocks or your entire portfolio in extreme market conditions. An enhancement to your existing stock positions for improved performance. An opportunity to outperform. Over and over. Freedom from the constant search for better ways to invest. A repeatable system that can "pay down" your stocks. A fresh perspective for today's markets. An complete understanding of one of Wall Street's best-kept secrets (which YOU can now implement). Not the same stock ideas you get inundated with every day, but stocks which have unique qualities that give them the potential to perform better. And it's all based on something you've probably never even noticed. I know it sounds a little unbelievable, but with these new skills under your belt, you can make just about any stock investment perform better. Truth be told, the success of a stock position all comes down to your purchase price...your basis in the stock. Not the fundamentals or the technicals. It's simple, but the lower that number is compared to current prices, the more profitable the position becomes. Well, I'm going to teach you how to improve your cost basis...over time...for any optionable stock and in any kind of market...period. Several things. First, the information you're getting is legit. And straight to the point. It contains no fluff, filler, or irrelevant theories that don't work in the real world of today's market. Second, your learning curve has been eliminated. I've already made the mistakes, stupid decisions, and screw-ups while mastering this craft. So you'll to learn exactly how to do things right, step by step...and sometimes more importantly...exactly what not to do. And finally, to get straight to the point, you're going to find out how to buy stocks at a discount, then get them generating cash for you...fast. That not only boosts your returns, but it creates a revenue stream for your account. I'll be sharing with you everything I know and do, from A to Z, in concise video lessons. That means I'm going to show you how to narrow your search for the right kinds of stocks, regardless of whether you rely on fundamentals, technicals, or even internet forum rumors. I'm going to show you how to instantly lower your cost basis in any stock. This way, your effective purchase price is lower than what you'd pay at market value, which is an enormous advantage that generates an immediate edge for your investment. I'm going to show you how to generate consistent income from the stocks you own. That creates a cash flow stream from your stock holdings, much like rental properties in real estate where someone else helps you pay for the investment. And I'm going to show you how to hedge and protect. Times can turn turbulent in a hurry, and sometimes uncertainty is the only certainty. You'll learn how to do this for not only individual stocks, but for your entire portfolio as a whole when conditions turn extreme. And a heck of a lot more. Plus, when you enroll, you get unlimited, lifetime access to the course. There's no hurry to beat an expiration date, and no need to find time in your schedule. Just go at your own pace. You can even watch the lessons from your smartphone or tablet. Here's the deal. You're going to get all of this for just $347. Yep. Just $347 will get the complete training course, and a direct line to me. It's the best deal I've ever offered. And you get instant, lifetime access to the lessons. One price. You get it all. It's training that can pay for itself hundreds of times over in your account. Hard to beat that kind of an investment. Try It Yourself RISK-FREE with Our Guarantee! Here's the guarantee. Enroll in the course. Watch all the lessons and test drive it for a full week. If you're not completely thrilled with the difference it's going to make to your returns, if you're not totally satisfied and didn't receive truly valuable information through the course that exceeds what you paid, just let us know within the first 7 days and we'll promptly refund every penny of your money. No questions asked. There's no fine print, no weasel-clause and no tricks to this guarantee. Try it for 7 days, and if during that time you're not happy for any reason, you get your money back. It's that simple. We won't risk our reputation over the price of this course, so you can enroll with confidence that we'll do you right. Directly below, you'll find the secure order form. Just sign up and you're in. After making your payment, simply sign into the site to begin accessing the course lessons just minutes from now. You're completely protected by our unconditional 7-day money-back guarantee. So why not take it for a test drive now? You've got nothing to lose and massive amounts of value and insights waiting for you inside that are going to radically change the potential for your portfolio (without making radical changes to your investment process). Remember, this is the best deal I've ever offered. And probably the most potentially lucrative for you, too. You're going to learn how to dramatically improve your returns without much effort at all, giving your future an entirely different look. You're going to learn the no-gimmicks, no-fluff truth on how to grow your IRA so that it's healthy one day when you need it. And you're going to get direct access to me, a market veteran, for help anytime you need it. Just click the big button below to get instant access now. Don't postpone this any longer. Seriously. 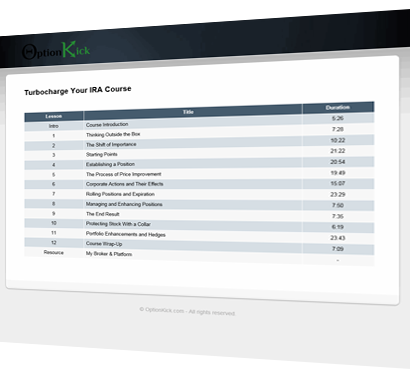 I understand the price I will be paying today for access to OptionKick's Turbocharge Your IRA training course is just $347. I understand that I will be receiving unlimited, lifetime access to the course lessons. I understand that the product is 100% digital and that I can access and it as much as I want, whenever I want, forever. I understand every effort has been made to accurately represent this product and it’s potential. I understand there is no guarantee that I will earn any money using the techniques and ideas presented here. I understand the examples here are not to be taken as a promise or guarantee of earnings. I understand earning potential is entirely dependent on the person using the training, ideas, timing, techniques and the effort they put forth. I understand that after making my payment, I will instantly receive login information giving me immediate access to everything (IMPORTANT: be sure to whitelist email from "optionkick.com").